In December 2012, Steve Zwinger’s phone started ringing, with many North Dakota farmers at the other end of the line. Conventional corn was at an unheard-of high of nearly $8 per bushel—but organic corn hit a flabbergasting $14 per bushel. Some organic farmers had even received $17 a bushel. Conventional farmers wanted to ask Zwinger, an extension agent for North Dakota State University, how they could cash in on organic corn. Unfortunately, growing corn organically is part of an overall system change, and it’s not as easy as switching seed varieties. More work is required, and the change can’t happen overnight—or even in one growing season. The beginning of agriculture approximately 10,000 years ago marked the start of organic farming. Farmers did not have a choice in the matter. No one had yet invented the Haber Bosch process, so there were no synthetic fertilizers. Farmers who wanted an extra boost applied the manure of livestock and birds to the land. The Romans, for example, were keen observers of the benefits of manure. The Chinese and Romans also advocated the use of human dung to manure their crops. Without understanding the science of nitrogen fixation, the Romans further observed that legumes enriched the soil and so should be grown in rotation with grains and vegetables. This way of farming had its drawbacks. Without pesticides to kill voracious insects, herbicides to kill weeds, and fungicides to kill certain pathogens, organic farming suffered from the caprices of nature. Fungal diseases ruined entire crops of rice and wheat. In perhaps the most infamous episode, the fungal disease Late Blight of Potato killed Ireland’s potato crops between 1845 and 1849. One million Irish starved, and 1.5 million fled to the United States and Canada, including an ancestor of President John F. Kennedy. What a blessing modern chemistry must have seemed. Fertilizers, herbicides, pesticides, and fungicides made agriculture more secure. The threat of starvation disappeared in the developed world. Though even amid the practice of scientific agriculture, diseases could bring destruction, as the Southern Corn Leaf Blight reminded farmers in 1970-71. Interest in organic farming, if dormant, was not dead and revived during the environmental movement. Biologist Rachel Carson’s Silent Spring (1962) pointed out the danger of agrochemicals to populations of wild birds. By the 1970s California farmers were growing organic garlic, and other crops followed, including corn. Like traditional varieties and genetically modified (GM) corn, most organic corn feeds livestock. Humans therefore consume organic corn—or any corn for that matter except cornmeal, sweet corn and popcorn—secondhand. Some growers of non-organic corn in the Dakotas grow the crop in monoculture year after year, notes Madison, S.D., organic farmer Charles Johnson. Other rotate corn with soybeans, a standard practice throughout the Corn Belt. Johnson, however, employs a six-year rotation so that he grows organic corn only every sixth year. He rotates corn with alfalfa, soybeans and oats. The alfalfa and soybeans, being legumes, are valuable in fixing nitrogen in the soil. The alfalfa also competes well with weeds, leaving a clean field in which to plant corn. Despite its appearance as a robust plant, corn does not compete well against weeds, particularly during early growth. Johnson pays particular attention to weeds. He harrows a field soon after seedlings emerge, cultivates the field repeatedly, and pays labor to hand weed. The harrow and labor are expenses that the grower of non-organic corn does not bear. Yet he has the cost of fertilizers, pesticides, herbicides, and fungicides that Johnson does not need to buy. Farmers need “to design an appropriate rotation to minimize weed pressure when growing (organic) corn, as well as insect and disease pressure,” says Patrick Carr, professor at the Dickinson Research Extension Center in North Dakota. Some organic corn growers, Zwinger notes, use fire to burn weeds. “They use propane torches,” he says. This is risky when corn is young because fire may consume it. A mature corn plant can be burned at the edges with no ill effect on yield. 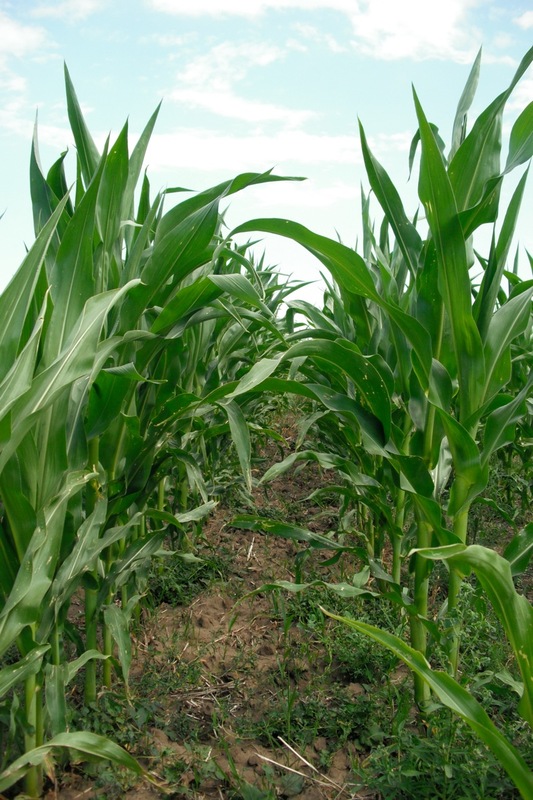 Carr points to another difficulty in growing organic corn: To be certified as organic, corn must not have been contaminated by any pollen from genetically modified (GM) corn. North Dakota farmers grow lots of GM corn, leading organic farmers to fret about how to isolate their corn from GM pollen. This is difficult because corn is wind pollinated. The wind may carry pollen one-third of a mile from its source, making contamination difficult to avoid. “The biggest drawback in my opinion to growing (organic) corn in North Dakota (or in many places in the U.S.) is that there is a lot of conventional GM corn being grown, so they will need to do all they can to ensure that their organic corn is somewhat isolated from a conventional neighbor’s corn to minimize pollen drift since there is zero allowance of GM anything in organic crops,” Carr says. Zwinger notes that organic corn is less drought-tolerant than GM corn and so may need to be irrigated. This is an additional expense that non-organic corn growers do not bear. 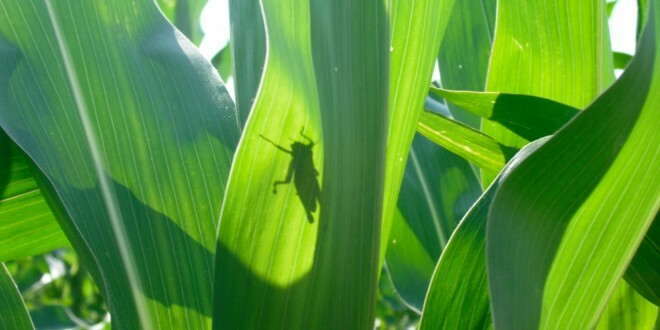 Perhaps for this reason GM corn is more popular in the Dakotas than is organic corn. Yield may also be part of the calculus to growing traditional varieties and GM corn rather than organic corn. The southern part of North Dakota provides the best yields for traditional varieties and GM corn. These yields top out at 230 bushels per acre, but this corn, like organic corn, is irrigated, notes Zwinger. He puts the average yield of traditional varieties and GM corn at 180 bushels per acre. In the central part of the state, yields average 135 bushels per acre. Organic corn, by contrast, averages 75 to 125 bushels per acre in North Dakota, Zwinger says. So which way of growing corn is more profitable? Traditional varieties yield more corn than organic corn, but organic corn fetches a higher price. Carr thinks organic corn may or may not be more expensive to grow than traditional varieties. “It could be (more expensive) if weeds are a problem in fields where organic corn is grown and an aggressive tillage strategy must be used to control weeds requiring multiple tillage passes,” he says. Johnson, however, is convinced that organic corn is cheaper to grow. He emphasizes that he need not buy all the inputs that traditional varieties of corn must have. He admits, though, that not every crop is his rotation is as valuable as corn, and because he grows corn only every sixth year he cashes in on corn infrequently. Brummond is not sure that even corn is profitable enough. “We typically can find better paying crops than corn organically in the Dakotas,” he says. Jeff Moyer, farm director at The Rodale Institute, has similar sentiments to those of Carr. What do you think? If you are a farmer, have you considered going organic? If you are a consumer, do you think “organic” on the label is worth something? Do you think if more farmers grew organically, it would have a positive effect on our communities? Join the conversation at DakotafireCafe.com!